Elizabeth writes, “the chattering, negative thoughts in my mind scattered in the wind of this statement like birds and jackrabbits and antelopes- they hightailed it out of there, terrified. Silence followed. An intense, vibrating, awed silence…… and in that regal silence, finally- I began to meditate on (and with) God”. I believe her- totally; because I too have heard this voice once. In 2007, a strange fancy struck- I realized that even though I have lived in India all my life, I have never seen the holy river Ganges -Ganga- ever. I worried that if I were to die in six months, it would be without the Ganga darshan, which seemed a pity. Suddenly it became of vital importance that I had to see the holiest river in India, right now. My husband looked at me as if I had lost my mind. And refused to come haring across a vast country, on a whim. “Okay”, I said, “I will go alone- I have to do this; I will leave the children with you. You take care of them.” He agreed- the children did not. From their point, they seemed to be missing out on a lot of fun. My daughter was twelve years old and son, five. The destination was Rishikesh- located in the foothills of the Himalayas; to a small Ashram, where the teacher was a lady, a scholar of the Bhagvad Gita, who dressed in lavender robes. The month was December- the harsh North Indian winter was nearing its peak. Not exactly the right time for a visit to the Himalayas. My son, small and frail, coughed continuously on the long train journey, despite all the bundling up in warm clothes. We reached the Ashram, this strange trio, and were received with love and kindness. The weather was bitterly cold. That night, I lay awake in bed, listening to the laboured breathing and continuous cough of my sleeping son. It broke my heart; it scared me. I was alone with two small children, for whom I was solely responsible and whom I had carted halfway across India, headstrong as always, despite the disapproval of their father. As far as negative chatter goes, I am second to none; I am the sort of person who does not need an external critic, because there is one always with me, living and breathing inside my skin. My critic is extremely intelligent and knows what exactly to say and when to say it, so that she has me in a sorry heap in no time, in silent uncontrollable tears. “You are no good; never was, you are a fake, a lousy mother/ wife/daughter…. stupid too- all said and done, nobody loves you, not responsible/knowledgable/good enough….” . So this was a good time! My thoughts ran in circles. I should never have left home. What if he worsens? What do I do? Why did I want to see the Ganga? Thoughtless, selfish… as always. My thoughts stopped as if a curtain had been drawn across them. I stared at the darkness in utter disbelief- where did That come from? Who is This? I thought I had come to see the Ganga and the lavender-robed teacher, who had spoken on phone with such an abundance of love- “my daughter”, she had addressed me. It was a long time since anyone had spoken with so much love… But to whom did this voice belong? Then suddenly, I experienced a peace, a compassion in my soul, as if all the weight on my weak and quivering soul was lifted and tossed aside in a moment. A peace that truly passed all human understanding. That night, held in the comfort of that smiling voice, I slept. And in the morning, my son had no trace of the cough at all. He skipped along in the Ashram gardens, a thin but happy little boy, admiring the flowers and birds. The Ashram overlooked the Ganga. There were rocks on the river bed, just below the Ashram, where there was a slight curve in the river. 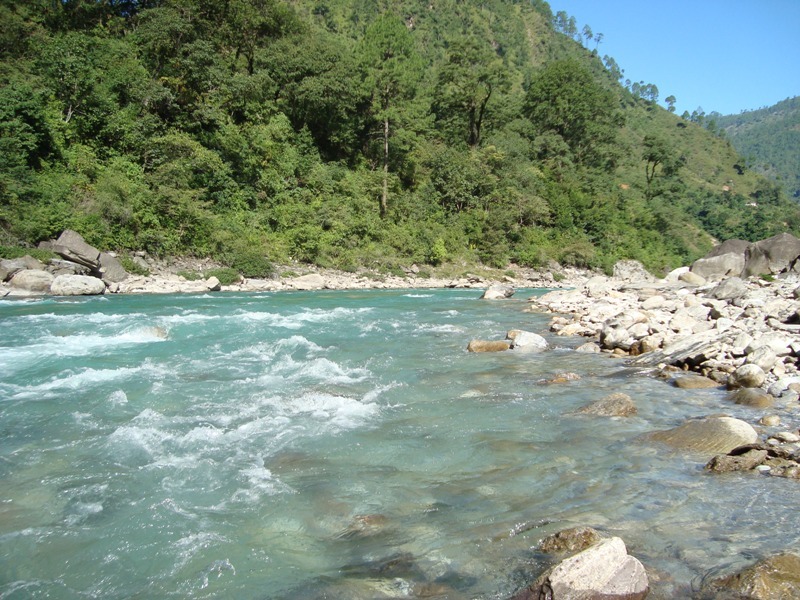 The Ganga had a music all of its own at that point, flowing turbulently over the rocks. The water was greenish blue, almost the shade of the Shivaliks in the distance. I did see the Ganga- and I did hear my Lord’s voice.